I really like family traditions. Getting out great grandma's roasting pan at Thanksgiving. Pulling out the LGB train at Christmas. Cuddling up to watch a great Christmas movie with the family while a fire is roaring in the fireplace. Yes, I love family traditions. And nothing says "I'm ready for winter" like getting the kids outside to spread poop in the yard. This is the time of year that I get the winter lawn ready (something that we do in Arizona and that seems really bizarre to my friends in the frigid Midwest). Every year, I almost skip doing it. I almost skipped doing it this year. I wasn't sure if I wanted to spend the money. I wasn't sure if I wanted to mow the lawn throughout the winter. I felt mildly guilty about the water use to keep the lawn going. So many things that pointed me to skipping the lawn for the season. But then I came across something that my 8-year-old daughter said three years ago when we were putting in the lawn. She was throwing handfuls of cow manure around the yard, and she exclaimed, "I'm like a flower girl, except with cow poop. I guess that makes me a poop girl." I remembered the joy that the kids had in helping me with everything that comes with putting in the lawn. I thought about the times I came home from work and played with the kids on the cool, dark green grass. I remembered playing bocce ball with friends who were staying with us, walking around the yard barefooted. So all of my reasons not to put in the lawn were overshadowed, and I decided it was time to get the kids outside to put in the lawn. So here are the 8 easy steps to putting in a winter lawn. 1. Two to three weeks before putting in a winter lawn (mid September in Arizona), slow down and stop your watering. This helps force the Bermuda grass into dormancy. 2. When the weather is consistently in the 60's at night, it is time to plant the lawn. Mow the lawn as low as your mower can take it, being careful to avoid your sprinklers. This year I only destroyed one, which is my new personal best. You might need to go over the lawn more than once, lowering the mower deck height each time. 3. Dethatch and bag the lawn. If you don't own a dethatcher (I don't know anybody who does), consider getting a dethatching blade for your mower. I love my Arnold Dethatching Blade. It has flexible, replaceable nylon dethatching lines that won't destroy your sprinklers, concrete, or hose. Dethatching breaks apart and pulls up all the layer that is between the green part of the grass and the soil. This helps the seeds to germinate and root in the soil more easily. 4. Now it's time for the fun. I like to use perennial rye grass seed. It costs a little bit more than the annual rye seed, but I have been really happy with the results over the past several years. Using a broadcast spreader or a drop spreader, spread the seed over the area where you want grass, avoiding the areas where you don't want grass. My kids love using the handheld broadcast spreader, so I keep them with their backs to the trees and facing the center of the yard. They also like just throwing handfuls of grass seed, usually while singing and dancing. 5. Cover with a thin layer of cow manure. 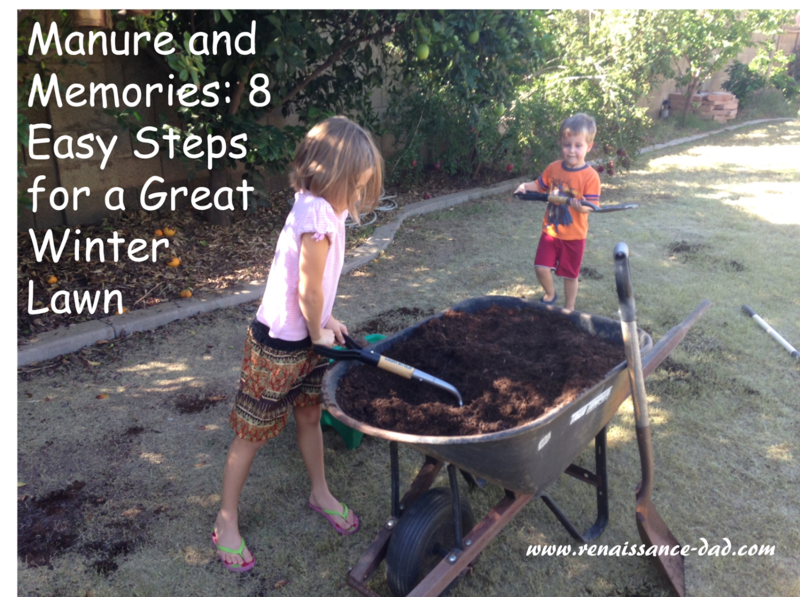 You can use a shovel and sprinkle the manure around the yard. Or you can do what my kids do and throw handfuls around. I'm sure that there are other, more bizarre methods that they will come up with in the future. I'll keep you posted. Regardless, this is my kids' favorite part (aside from playing in the grass a few weeks from now). Go over any thick areas of manure with a rake to keep the manure layer thin. 6. Water several times per day for about two weeks until the grass starts to sprout and fill in. Look for any bare spots and sprinkle a handful of seed to fill in. 7. Be patient for the first mowing. Let the grass grow and fill in. Then cut it long, and eventually bring it down to the height that you want. 8. Mulch the grass when you mow. By keeping the grass clippings on the yard, you are continually feeding the grass that is there and will end up with a healthier lawn. Really, this whole process is worth it to watch your kids play in cow poop. And recorded giggles and quotes will be well worth the work now when they bring home their first boyfriend or girlfriend in the future. 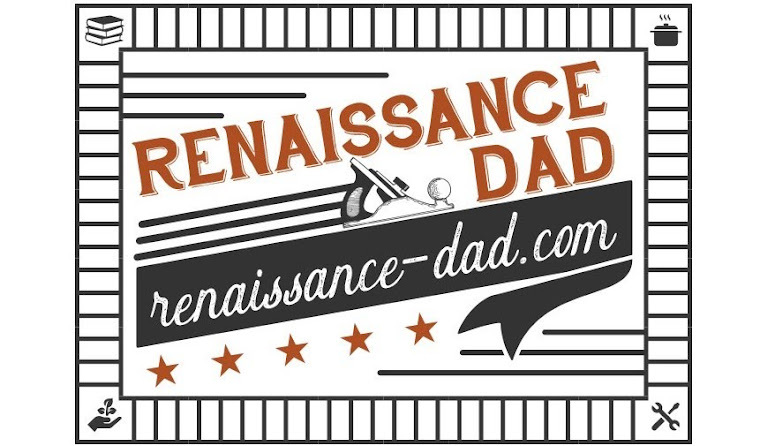 Happy beginning of winter, Renaissance Dad readers. Have a great season of making family memories.